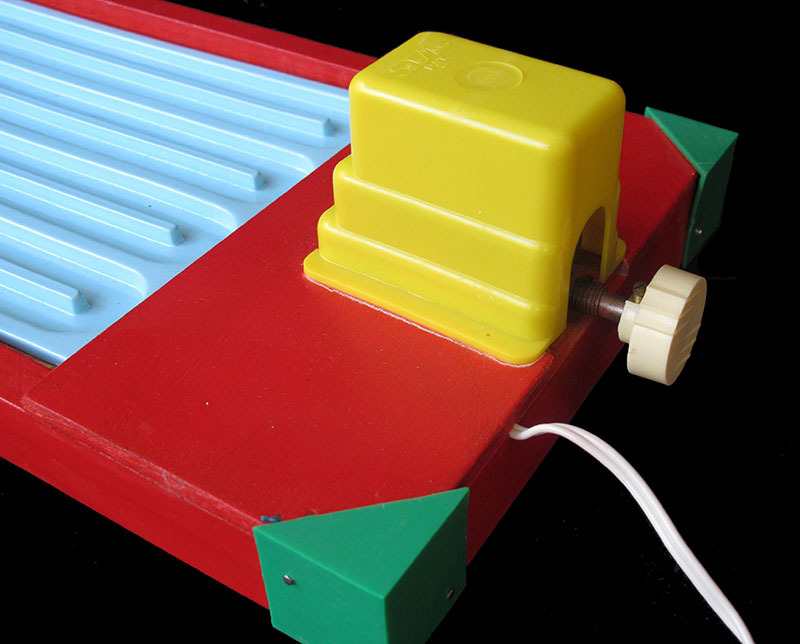 This is a mechanical game made by Sel-Mac in Barcelona. Some things about this game are obviously strange. First of all there is the title of the game in English and the subtitle "Elektrische Rennanlage" ("electric racing system") in German. One has to understand that nobody spoke English (much less German) in Spain when this game was made. We can think that the game was made to export, but the only copies I have ever seen are in Spain, so it does not look like it sold much abroad. 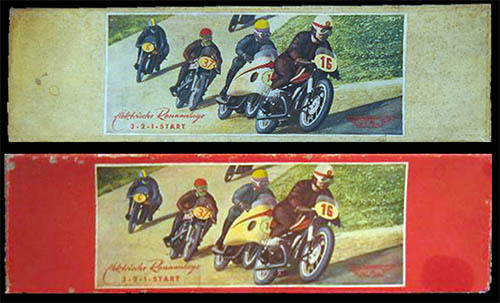 The second obvious weirdness is the motorcycles featured on the box, while in the game you find cyclists, cars, and horse, but no motorcycles. Finally, the game was packed in boxes of different colours. In this case, the box is light blue, as you can, see, but there were more colours (see below). These boxes, by the way, are quite big: they measure 70 x 21 x 10 cms. Beware, this game works with 125 V.
The game consists of 4 oval tracks wich vibrate. 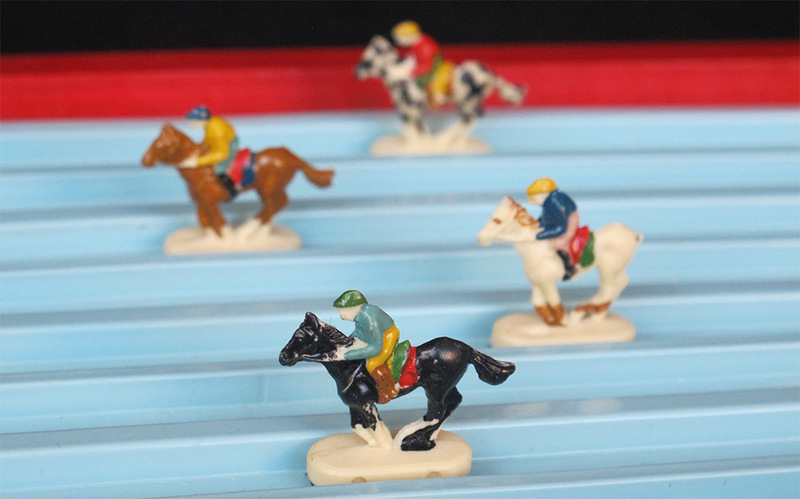 The cyclists (or cars, or horses) are unevenly weighted so that they always advance, no matter in what part of the vibrating track you place them. You can control the vibration, so that the board vibrates more when the riders are in the straights and less when they are in the curves. This way the riders are faster on the straights, but they do not fall off the track when they arrive to the bends. Of course, this is a correct strategy a long as there is only one cyclist/car/horse on the track. Unfortunately I do not have a copy of the rules to check if time trials are mentioned. 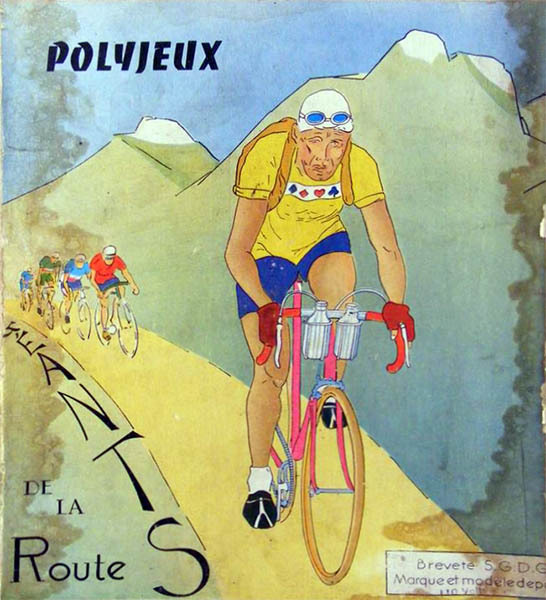 While the box is quite big, the cyclists, obviously, are not: they measure just 24 mm. 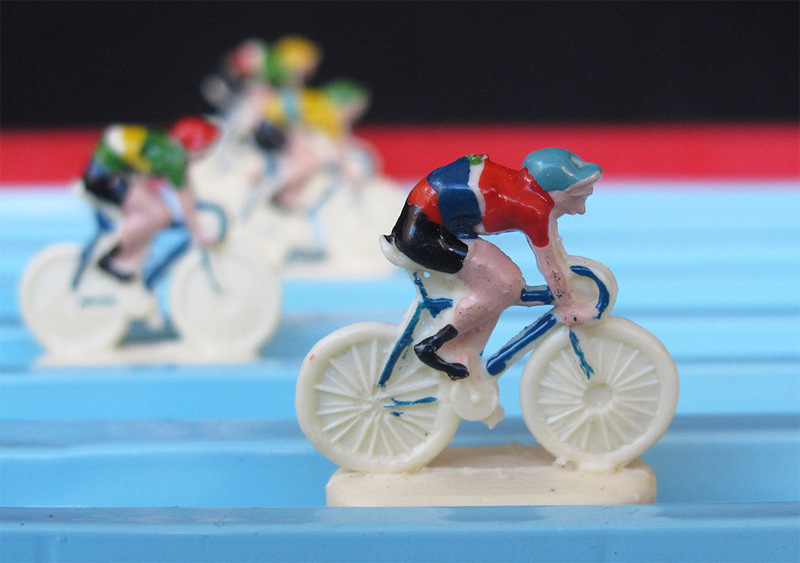 Cyclists are made of a hard plastic, maybe bakelite, and they are hand-painted. Nice cars, though poorly painted. Nice illustration... but why motorbikes??? It looks like everytime I see this game the colour of the box is different! 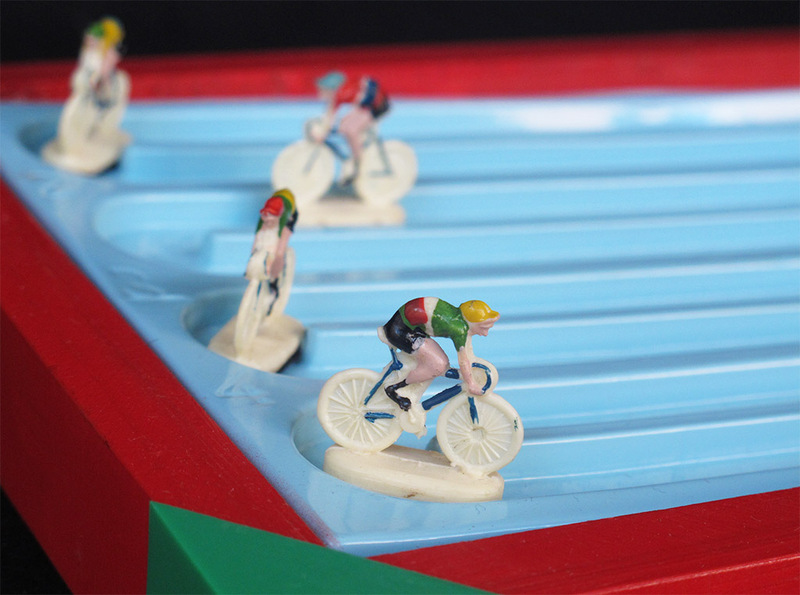 In France the same game was called "Les Géants de la Route (by Polyjeux). 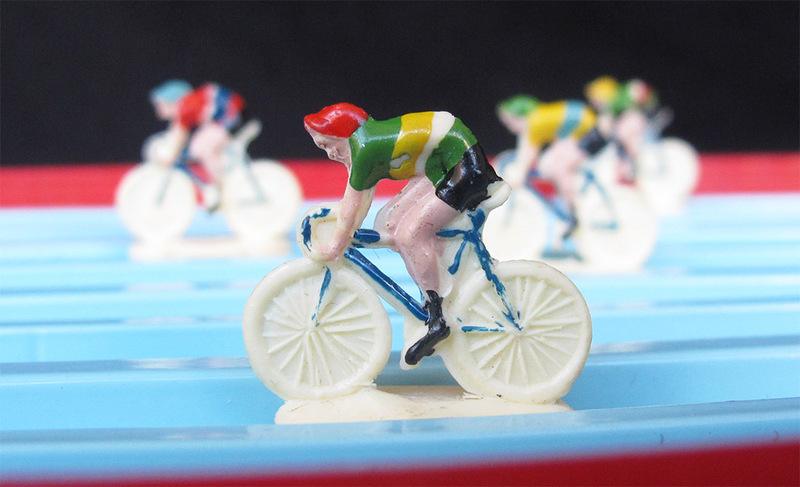 Despite its unmistakably cycling-related name, it also included cars and horses.